i think these bracelets from brvtvs are pretty great - but i bet you could make one for yourself (i might try my hand at it on the car ride to vancouver tomorrow). 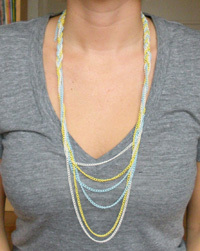 seems like all you would need is a chunky gold chain, jump rings, clasp, and embroidery floss. stay tuned, i'll let you know how it turns out. Those are very cool looking, better than the ones we made in grade school! The combination of textures is great! wow what an awesome idea! totally inspired to make one with some of the vintage jewellery I have. thanks for posting!